Discussion chaired by Frank McDonald, journalist with The Irish Times, on a broad range of architectural and developmental issues that have become apparent in Celtic Tiger Dublin. Contributors include Dr. Gary Boyd, Ciarán Cuffe TD, Robert Ballagh and Siobhain Ní Éanaigh. The majority of the speakers were very critical of Celtic Tiger Ireland, a change from previous "architectural discussion". The talk happened in Docklands "white elephant", CHQ, aka: Stack A. "Finally the realizion of Maggie Thatchers demented vision of there being no such thing as society"
"The end of the boom is something we should welcome, there will enter a period of recession, we can think about what legacy we have left..."
So were 2 of the phrases used by Frank Mc Donald in his summary and introduction to over 400 architectural youth from all over Europe, who came last summer to our island to participate in a 2 week summer school exploring in Dublin and out west in Letterfrack, the theme of "adaptation"
3 - Dr. Gary Boyd, Scottish architect teaching in Cork school of architecture, talking about public city, the politics of space and control, housing apartheid etc... very good to hear these views expressed. 4 - Ciarán Cuffe TD for the Green party and architect, Dublin and its contrasts and green dreams. 5 - Robert Ballagh, artist and social political activist, talks about how CHQ was nearly the city art museum as well as his take on the city. This talk was followed by the GREEN AND BLUE walk, one of the many post talk city wanders, this one walked along a possible Dublin city greenway and food production zone, the Botanic Spine. Adapt Or Die, Blessed Unrest @ Letterfrack? EASA (European Architecture Students Assembly) is an annual assembly of 400 architecture students which takes place over a two week period every August. The aim of the organisation is to encourage cooperation between students from over forty European countries through the media of architectural workshops, lectures, informal debates and exhibitions. EASA is a practical network for communication, meeting and exchange; architecture students can discuss their ideas, work together and exchange their experiences concerning architecture, education or life in general. The official language of the assembly is English, and members live and work on-site for two weeks. The organisation has no standing connections with professors, academic bodies or professional bodies. You don’t need to register to an organisation, association or company or pay a periodic fee. If you want to get involved, contact the EASA representative - the National Contact or NC - of your country. 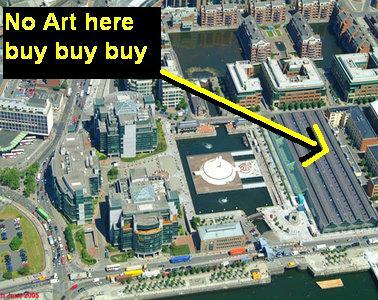 Stack A / CHQ : No Art here, buy buy buy - how "community spaces" even got taken from Dublin people. It was quite ironic that we had this discussion in a space, which COULD have turned into a major positive node for Dublin, Stack A. Apparently in the early days of Charlie Haugheys deal to construct the IFSC, Stack A was designated as some sort of "community space", in the end, as stated by Frank Mc Donald and Robert Ballagh, it has turned into yet another space of consumption.... But now that its crisis time, perhaps we will see a change?? Im attaching an MP3 from Mary Cummings, of the NWWC, North Wall Womens Centre @ Sheriff Street, in which she is talking about a brief history of the area. With the exception of the ending - I see this video as being about Dunk - Dunk as Utopian Architect and cities need people-centred utopian architects!